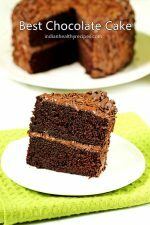 Chocolate cake recipe – Did you ever dream of baking the best chocolate cake? 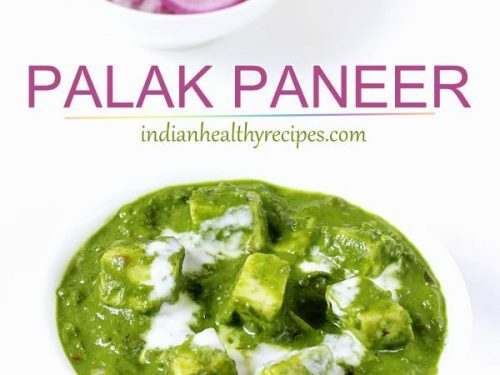 I did and my dream came true when I tried this recipe for the first time years ago. 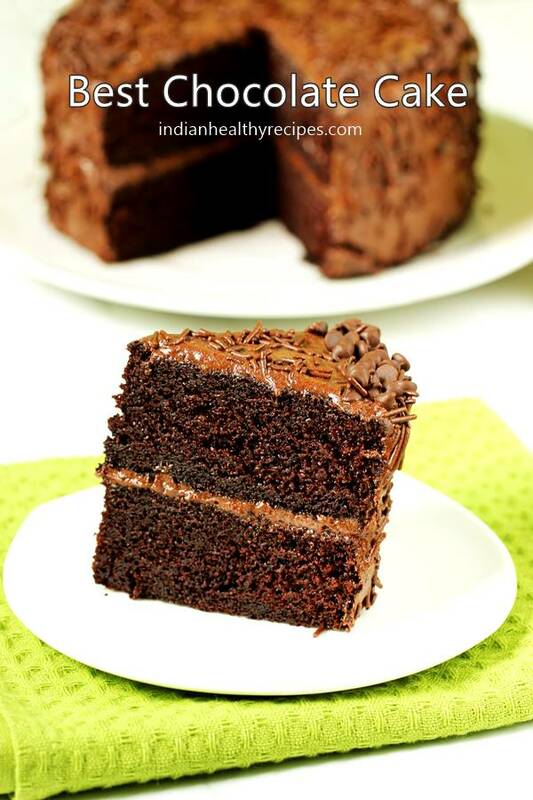 This super delicious, moist & rich chocolate cake has never failed to amaze my family & friends. 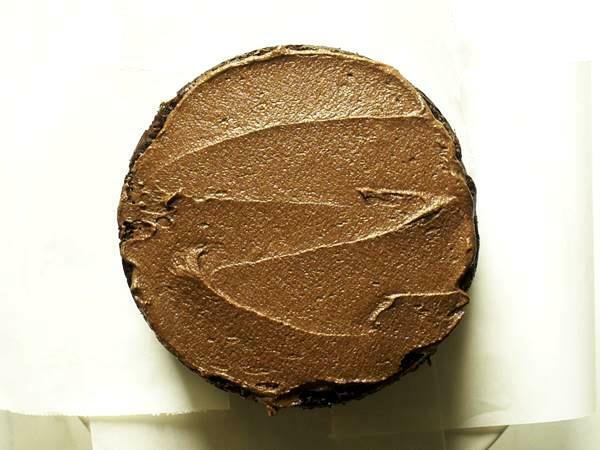 This best chocolate cake recipe is simple & easy to follow even by a beginner. It is a one bowl cake that just needs a whisk, no mixer needed except for the frosting. This recipe uses 1 egg which helps the cake to rise & keeps it moist. 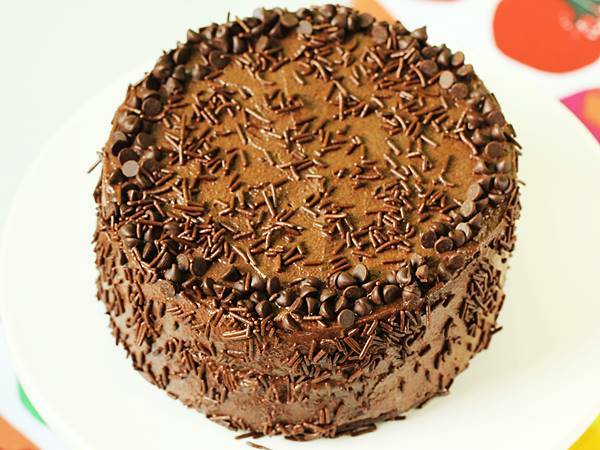 If you do not eat eggs, then you can check this moist Eggless chocolate cake. I have baked this cake in a oven. If you do not have a oven you can also bake it in a cooker or a heavy bottom pot following this post on Cooker cake recipe. 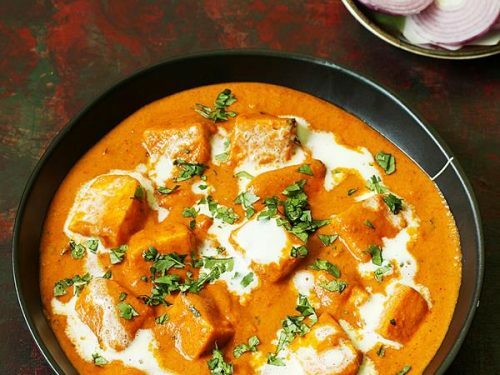 The following tips will help you to adapt the recipe to different pan sizes. 1. I have baked this cake in two 6 inch round pans as I do not prefer to cut my cake to layers. If you do not have 2 pans then you can bake it in a single 7 or 8 inch round pan. To make it a layered cake you will have to cut the cake to 2 layers and then frost. 2. This recipe cannot be halved but can be doubled to make a 2 or 3 layers 8 inch cake. 3. The recipe can be used to make 12 cupcakes. 4. Do adjust the baking time depending on the pan size used. 5. I have made chocolate buttercream frosting which needs a stand or hand mixer. 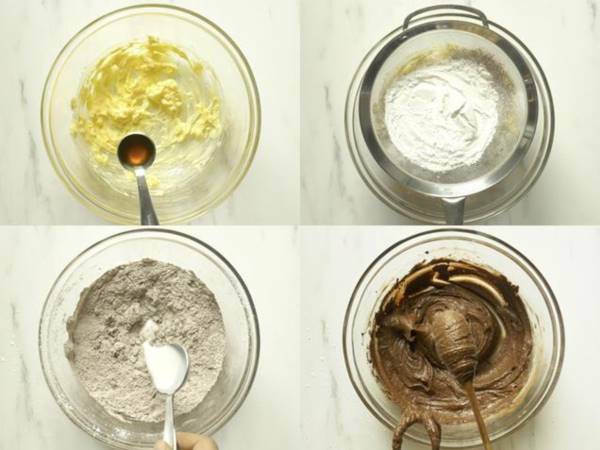 If you do not have one, you can also beat the mixture using a whisk but it is a bit of arm work. 6. 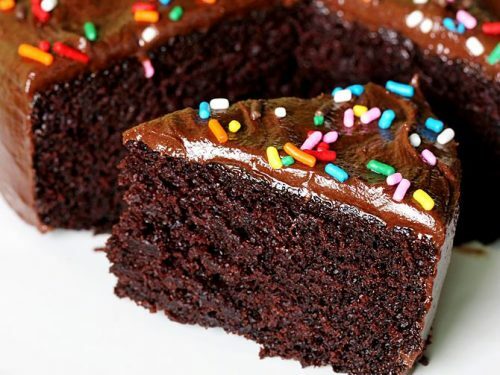 You can also make a simple chocolate ganache instead of buttercream frosting or spread some melted chocolate over the cake. 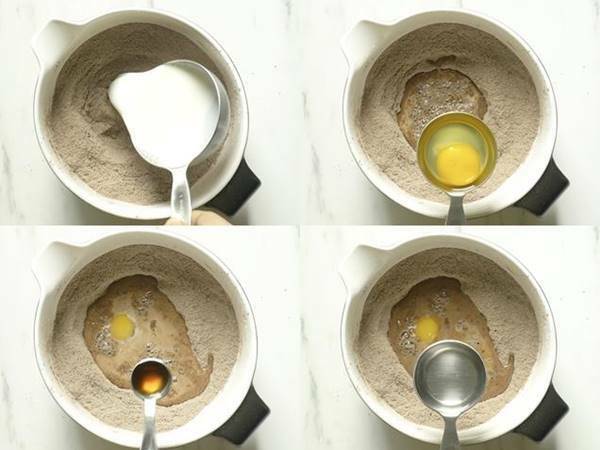 This needs no mixer & you can bake the entire batter in a single pan. 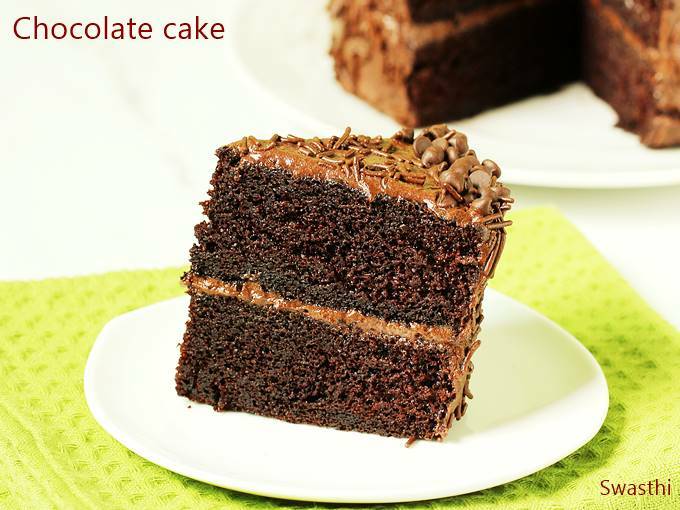 Chocolate cake recipe – Rich, moist & delicious chocolate cake for beginners. 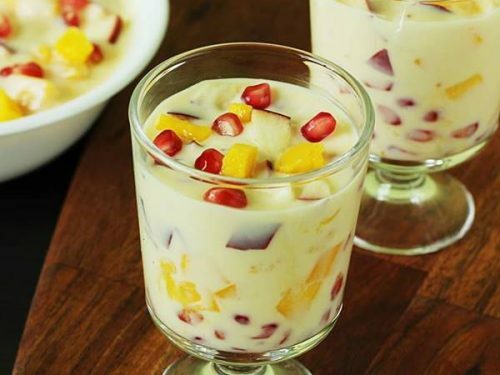 This recipe is super simple to make and is done just in 2 steps. Grease and line 2 – 6 inch cake pans or 1 – 7 or 8 inch pan. Preheat the oven to 175 C for at least 15 mins. 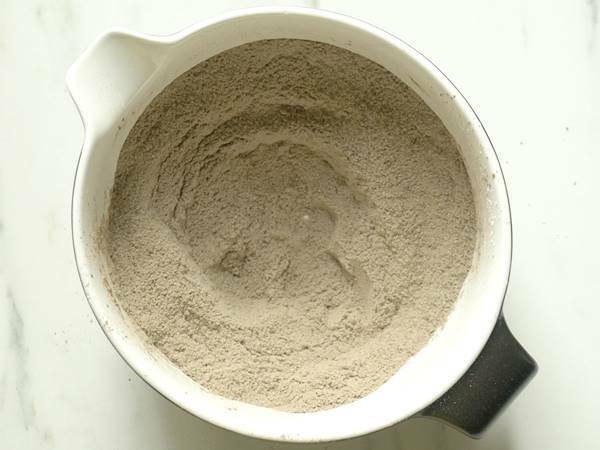 Sieve together flour, cocoa, salt, baking powder and baking soda to a mixing bowl. 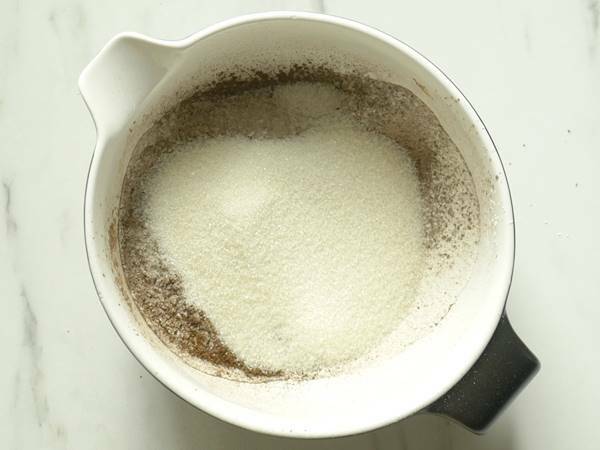 Add sugar to the bowl. Give a good stir until well combined. Make a well in the center of the bowl. Pour egg, oil, vanilla extract & milk. Whisk together all the wet ingredients. Then mix wet and dry together until just combined and no lumps appear. 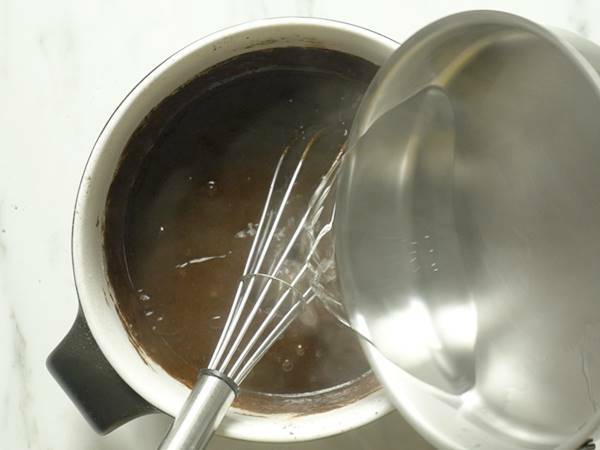 Pour boiling hot water and whisk until all the water is absorbed by the batter. The batter is runny at this stage. Pour this to the cake pans. Tap the pans gently twice to the counter. Bake at 175 C for 28 to 30 mins or until the tester inserted comes out clean. Please adjust the timing as it depends on the oven. Cool the cake in the pans on a wire rack for 10 mins. Invert to a cooling rack and cool completely before frosting. Ensure butter is soft yet cold. 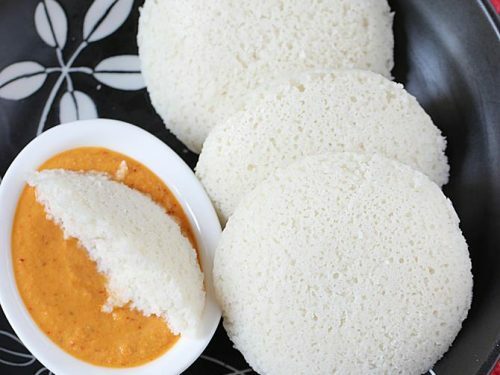 Beat it until light & creamy for 2 mins. Then add the rest of the ingredients except milk. Beat until smooth, light and creamy. If the frosting is too thick add milk and beat. If it becomes runny, just add more powdered sugar. Refrigerate for a while and spread on the cake. For more details watch the video. 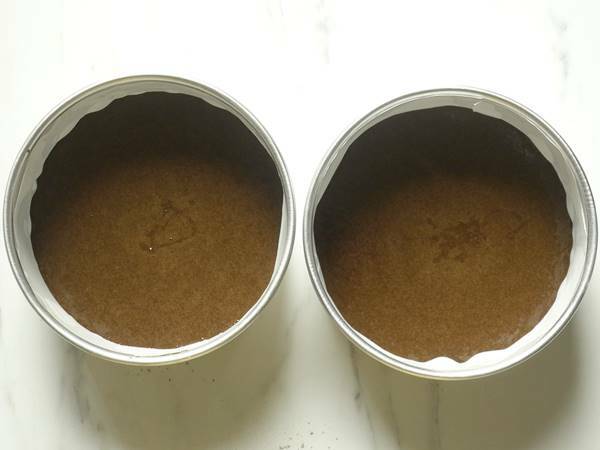 Refrigerate and use up the chocolate cake with in a week. 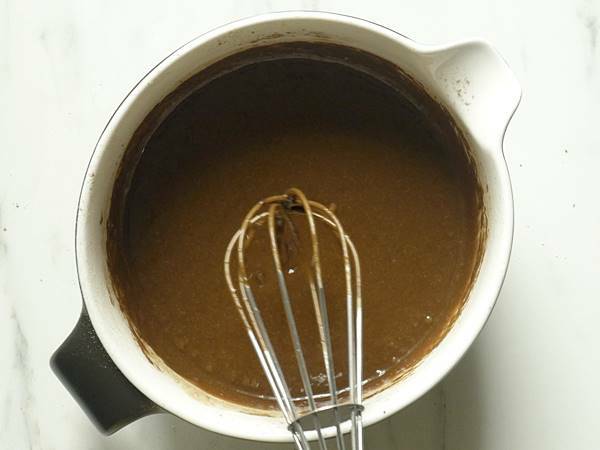 Ensure you use good quality cocoa and a flavorless or neutral oil. This is a old recipe I shared in 2014, I updated with video & measurements in grams. Preheat the oven to 175 C or 350 F for at least 15 mins. 1. 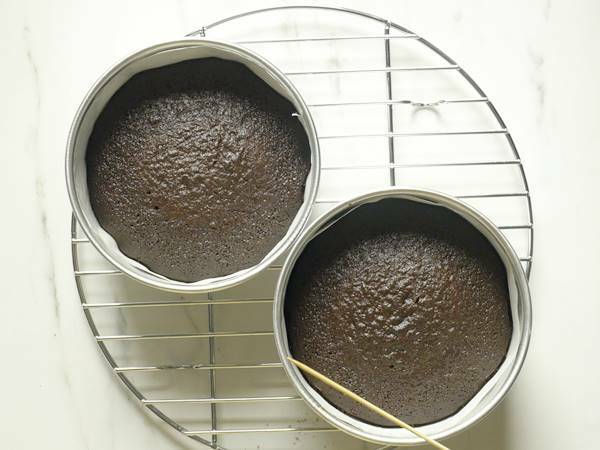 Grease and line 2 – 6 inch cake pans. 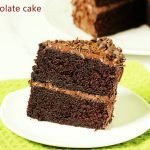 You can also make a single layer cake in a 7 or 8 inch pan.You can also just grease and dust with some flour or cocoa. 2. 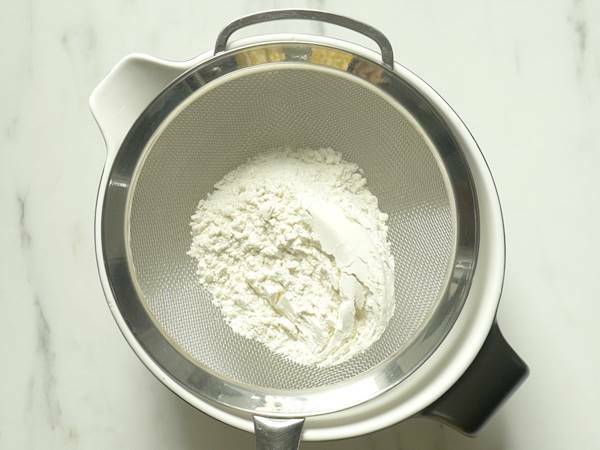 Place a sieve over a mixing bowl. Add flour. 3. 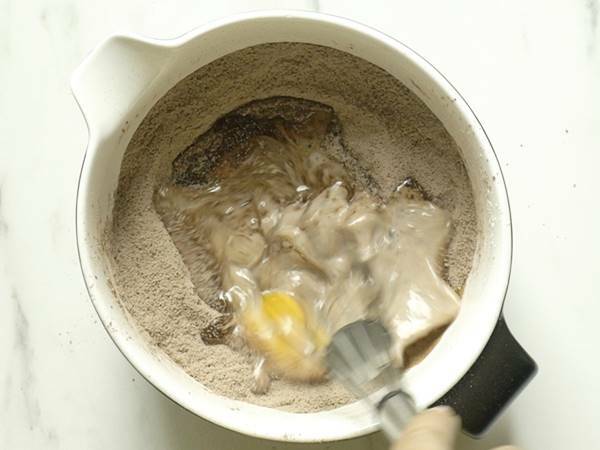 Add the rest of the dry ingredients – cocoa, baking powder, baking soda and salt. Sieve them all. 5. 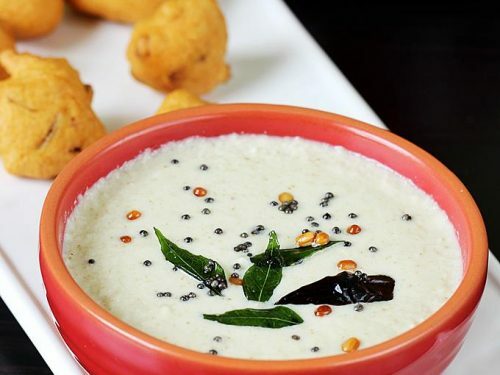 Mix everything very well until uniform. Make a well in the center. 6. Heat half cup water in a pot. 7. Pour milk, egg, oil and vanilla. 8. Whisk the wet ingredients first. 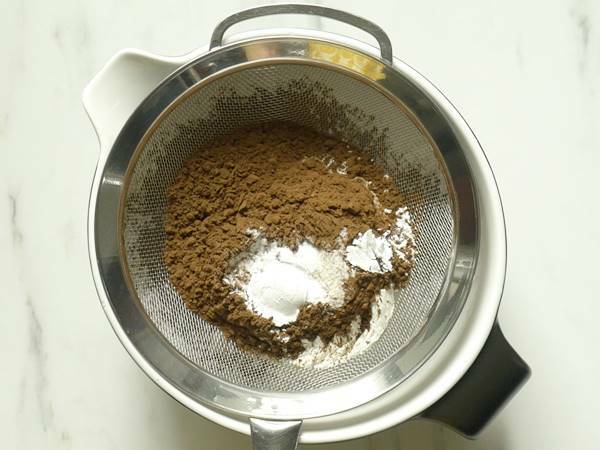 Then whisk together wet and dry ingredients just until combined. Do not over mix. 9. You will have a slightly thick batter at this stage. 10. Quickly pour the hot water to the batter. The water must be very hot. 11. Immediately whisk the batter just until the water is absorbed and the batter looks uniform. Batter is very runny at this stage. 12. Pour this to the pans. Tap the pan to the counter 2 to 3 times. 13. Bake for 28 to 30 mins or until the tester comes out clean. Please adjust the timing depending on the oven and pan sizes. If baking in a 7 inch pan you may need to bake upto 35 to 38 mins. Cool the pans on a wire rack for 10 mins. 14. Then invert to a cooling rack. Cool completely before frosting. 15. Please follow the recipe card to make the frosting. I have shared below quick tips on how to frost the cake. 16. 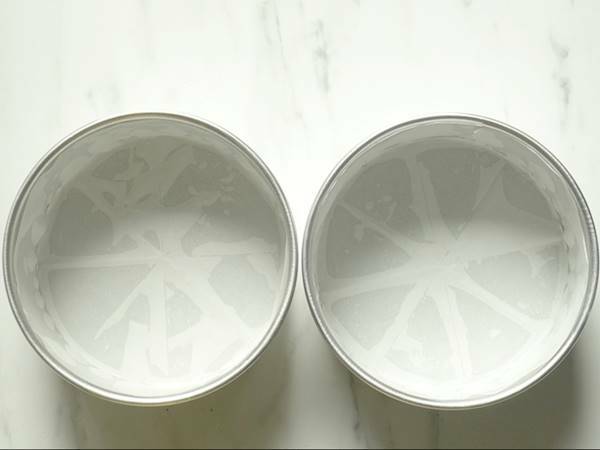 Spread a tsp of frosting in the center of the cake board or cake stand. Place 4 parchment papers on all 4 sides such that they don’t touch the frosting. Place the cake on the parchment paper. The center of the cake has to be on the frosting that was spreaded. Begin to spread the frosting with a spatula. Even out for smooth surface. Place another cake and repeat the frosting. Then frost on the sides. Smoothen the sides as well with the spatula. 17. I just used some choco chips and sprinkles on top. Then remove the parchment paper gently. You are welcome. I just understand the cake needs to be baked a little more. The timings mentioned in the recipe are near approximations. Each oven is different & one may take a little longer than the other to bake. Once you understand your oven well you will know how to adjust the timing. Before taking it off the oven, always test the cake with a skewer if it is done. The skewer must come out clean without any batter stuck on it. This indicates whether or not the cake is cooked fully. Hope you got it. Thank you. Thank you so much for trying. Glad to know it came out good. you are welcome. Thanks for trying. Happy to know they turned out good. December is the season for cakes and this seems too much delicious I will surely cook it on Sunday. You are welcome. Thanks for trying. Thanks for trying. 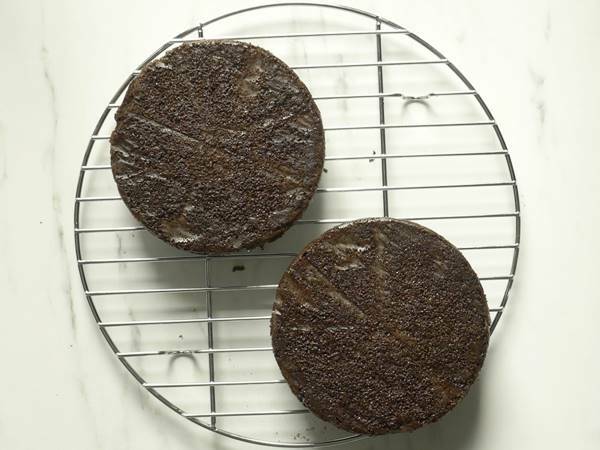 A crust can form if the cake is over baked or if the pan too small for the batter. With this recipe the cake top should be moist. Not sure if you have over baked. Even the pan size could be a issue. 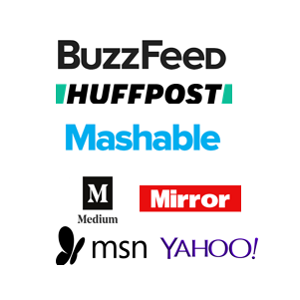 A little research from your side should help you to fix it.